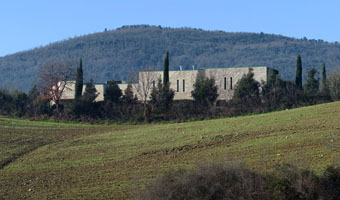 With Monteti 2008 we have reached new heights in the production of our flagship wine. Considerably well-balanced, the wine matured earlier than its predecessors showing from the moment it was blended a delightful harmony between its various components. Scents of walnut and cedar embrace notes of black fruit and toasted bread. In the mouth, silkiness and freshness interweave with an excellent web of tannins leading to an excellent and long finish. 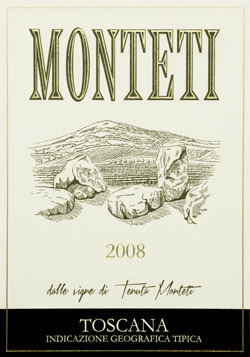 “The 2008 Monteti impresses for its depth and pure sensual expression of fruit” (The Wine Advocate by Robert Parker, 94 points). An excellent year. The vines enjoyed vigorous vegetation and phenological phases within the norm. The buds appeared in the second half of March after a dry, mild winter. Spring was rainy especially during budding. The temperatures in summer were particularly high, interrupted by occasional rainfalls. The harvest was slowed down by some rain soon cleared by a nice northerly wind in the last ten days of September which brought cool air and sunshine. The harvest was completed on the 9th of October. All the grapes were harvested in excellent conditions and at a perfect ripeness stage. The three varieties used in the 2008 composition gave excellent results. VINIFICATION: temperature-controlled spontaneous fermentation with indigenous yeasts. The vinification of the grapes from the various land parcels of our vineyards takes place separately in open tapered steel vats. MACERATION: up to 21 days depending on the variety. Long contact with lees to halve the use of sulphites. MATURING: 18 months in French oak barriques (70% in new, medium-toasted barriques and 30% in barriques used for the second time). This is followed by further 24 months of bottle ageing.